You can now positively select immune cells and then release bound magnetic particles from your isolated cells. 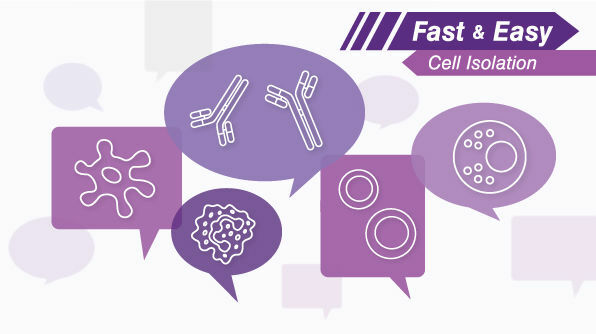 EasySep™ Release combines the speed and ease of the EasySep™ cell isolation platform with the flexibility of the new Releasable RapidSpheres™ for the separation of particle-free, highly purified immune cells. Mix and match with non-releasable EasySep™ cell isolation kits that use Dextran RapidSpheres™ to isolate unique and rare cell types by performing sequential positive selections. PARTICLE-FREE. Culture and analyze your positively selected cells without magnetic particles. FLEXIBLE. 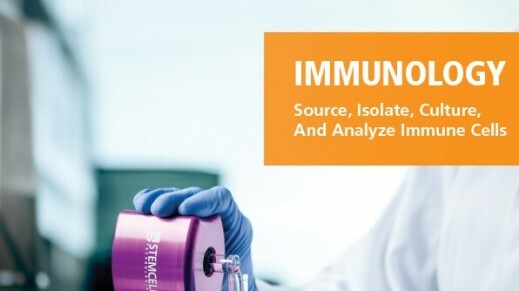 Perform sequential positive selections to isolate unique and rare cell types. FAST AND EASY. 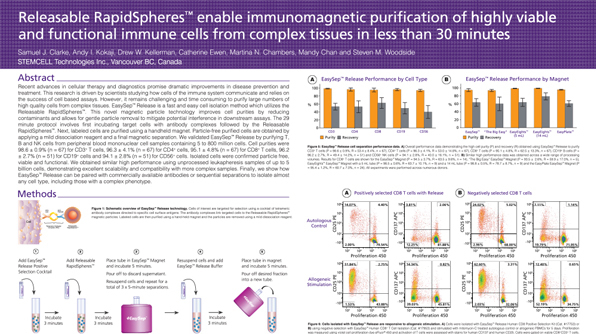 Obtain highly purified cells free of magnetic particles in under 30 minutes. COLUMN-FREE. 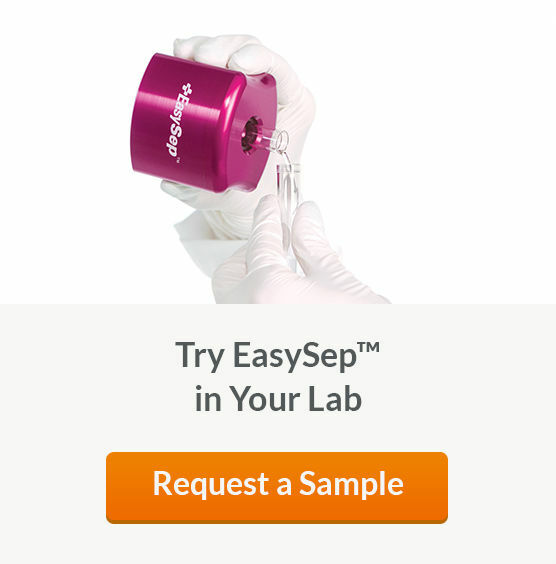 With no columns, the simple EasySep™ pour-off is gentle on your cells. *These kits are designed to isolate cells that are labeled with either PE- or biotin-conjugated antibodies by immunomagnetic positive selection. They may also be used for cell isolation from other species (e.g. rat) provided a suitable blocker is available. Figure 1. Typical EasySep™ Release Human CD3 Positive Selection. Starting with a single-cell suspension of human PBMCs, the CD3+ cell content of the isolated fraction is typically 98.7 ± 0.9% (mean ± SD using the purple EasySep™ Magnet). In the above example, the purities of the start and final isolated fractions are 38.4% and 99.0%, respectively. Figure 2. Typical EasySep™ Release Human CD19 Positive Selection. 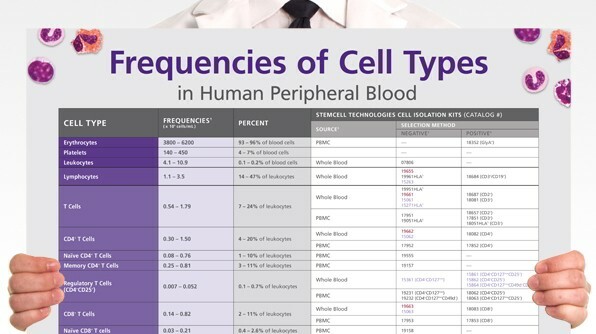 Starting with a single-cell suspension of human PBMCs, the CD19+ cell content of the isolated fraction is typically 97.7 ± 2.3% (mean ± SD using the purple EasySep™ Magnet). In the above example, the purities of the start and final isolated fractions are 6.2% and 98.0%, respectively. Figure 3. Isolation of Mouse Lung Epithelial Cells. Mouse lung cells were firstly labeled with PE-conjugated anti-mouse CD326 (EpCAM) and biotin-conjugated CD45 antibodies. EpCAM+ cells were positively selected using EasySep™ Release Mouse PE Positive Selection Kit, and subsequently, CD45+ contaminating leukocytes were depleted using EasySep™ Mouse Biotin Positive Selection Kit. Isolated EpCAM+CD45- cells were 86% pure. Figure 4. Isolation of Mouse CD4+CD304+ Cells. Mouse spleen cells were labeled with PE-conjugated CD304 (Neuropilin-1). 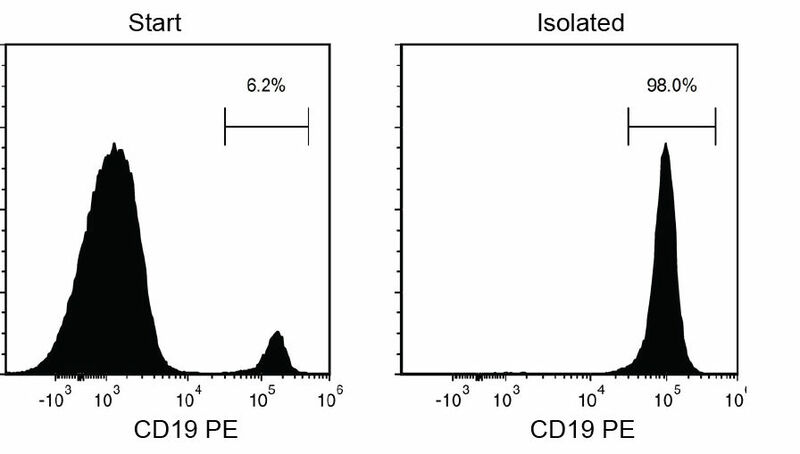 CD304+ cells were positively selected using EasySep™ Release Mouse PE Positive Selection Kit, and subsequently, CD4+ cells were negatively selected using EasySep™ Mouse CD4+ T Cell Isolation Kit. 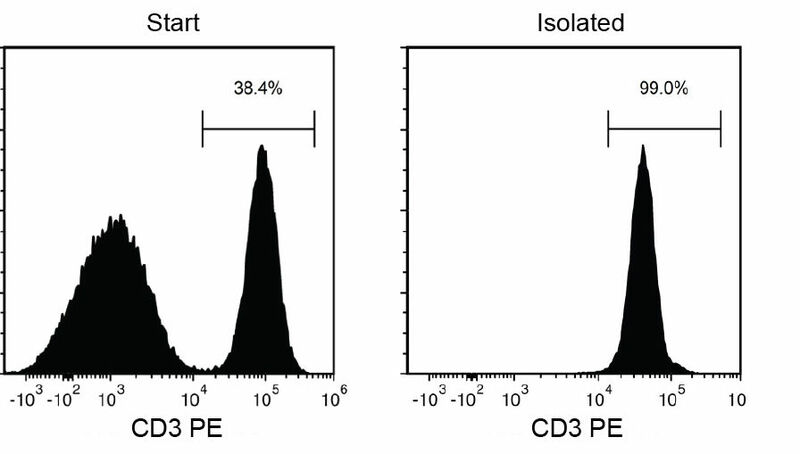 Isolated CD4+CD304+ cells were 92% pure.